Simply Divine pairs each flameless candle with a uniquely blended fragrance for re-scenting. Each electric candle will last for quite a long time without the need to re-scent, however dependant on how many hours per day/week/month the electric candle is on. After a few months the candles fragrance will need to be spruced up. 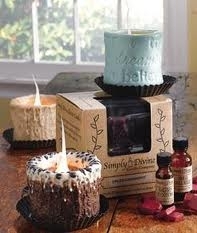 Simply dip a Q-tip in your oil and swirl the tip on the inside of your electric candle...and your candle is re-scented!